Atrophic scars can result from any inflammatory skin disease causing sufficient damage to the epidermis and to the dermal collagen. The most common causes of atrophic scars especially on the face are severe nodular or nodulocystic acne, infections like varicella and Herpes simplex, trauma including burns and lastly, surgical procedures. Facial scars resulting from any of these etiologies are associated with psychological trauma and loss of self esteem. Successful treatment of these scars can be a satisfying experience to the patient and the treating physician. For the present study we used a fractional CO 2 laser Qray-FRX from Dosis, Korea marketed by Coherent India Ltd. The machine has two separate hand-pieces for fractional CO 2 laser and non-ablative radio-frequency with infrared non-ablative laser combination. For treating acne scars, only the Fractional CO 2 hand-piece was used. 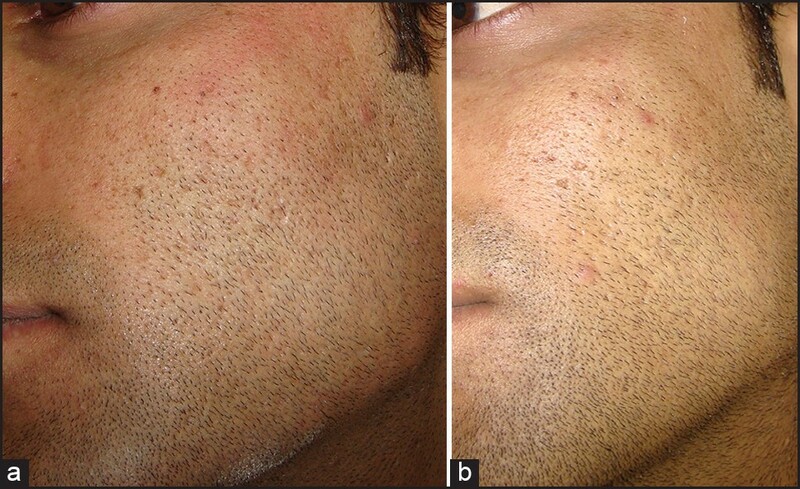 Sixty patients of moderate to severe atrophic facial acne scars were treated with fractional CO 2 laser resurfacing monotherapy over a period of three years from February 2010 to January 2013. Exclusion criteria included keloidal tendency, pregnancy, active acne, immunosuppression and concomitant isotretinoin use. Patients who were using any topical treatments for acne or for scars were told to stop these medications at least 1-week before the start of fractional laser treatment. No concomitant cosmetic procedures were allowed between the laser sessions and no topical drugs were prescribed except sunscreens and topical antibiotic creams in the post-procedure period. After an informed consent was taken, a baseline photograph showing all the scars to be treated was taken using standard camera angle and light settings. Then, a topical anaesthetic cream containing a eutectic mixture of topical tetracaine and lignocaine in a cream base (Tetralid R cream) was applied for 1 hour on the treatment area to achieve a satisfactory anaesthetic effect. After satisfactory anaesthesia was achieved, the treatment area was cleaned with a mild cleanser followed by 70% ethanol solution. Fractional CO 2 laser treatment was then delivered to each atrophic scar present. Fluence ranging from 15-25 J/cm 2 was used at densities of 100-150 MTZ/cm 2 , thus providing about 40-45mJ of energy and an ablation depth of 1.0-1.2 mm at each spot. A single or double pass was used over each scar along with its margins. Each morphological type of scar was treated in a similar manner and the patient was advised skin cooling with ice-packs for 5-10 minutes after the procedure to take care of post-treatment erythema, oedema and burning sensation. The patients were instructed to prevent sun exposure for the next 4-5 days after each procedure and a topical non-occlusive antibiotic cream formulation was prescribed over this period. The patients were also encouraged to use a broad-spectrum sunscreen liberally in between the laser sessions. Oral acyclovir was prescribed only to those patients who had a history of recurrent Herpes simplex infections. Laser procedure was repeated every 6 weeks and a total of 3-4 sessions were performed in each patient. The laser parameters were kept identical at each visit and if the patient was satisfied with the results obtained after the 3 rd session, the 4 th session was not performed. Digital photographs were taken using identical lighting, angle and face position settings at every follow up visit. The final assessment was made subjectively by a single observer at the last follow-up visit, 6 months after the last laser session and a quartile grading scale was used to assess the response objectively. A score of 0, 1, 2 and 3 was thus given if the response was <25%, 25-50%, 51-75% and >75%, respectively. The response was termed as excellent if the score was 2 or more and good if the score obtained was 1. Patients getting a score of <1 were termed as 'poor' responders. In addition to the photographic and clinical assessment, the patient's satisfaction to the treatment was also recorded at the final visit. Adverse effects, if any, were also monitored at each follow-up visit. The demographic profile of the patients is given in [Table 1]. There were 25 males and 35 females in the study group and majority of them (38 patients) were in the 3 rd decade of life. There were 3 patients with Fitzpatrick skin type 2, 39 patients with skin type 3 and 18 patients with skin type 4. All the cases had moderate to severe atrophic post-acne scars (Grade 3 and 4 scars by Goodman and Baron Classification system). In majority of cases (35 out of 60), all the different morphological types of atrophic scars were present. The commonest sites involved were the cheeks followed by temples and forehead. At the 6-month follow-up visit after the last laser session, a positive response with either good or excellent results was documented in 41 patients corresponding to 68.3% of the study group. Of these 41 responders, there were 11 patients (18.3%) in whom >75% improvement was seen in scars and skin texture [Figure 1] while in 15 others, the improvement was in the range of 51-75%. Thus, excellent response (score 2 or more on quartile grading scale) was observed in a total of 26 patients (43.3%). Fifteen patients (25%) showed a good response while 19 patients (31.7%) failed to demonstrate any significant response to treatment with <25% improvement on the quartile scale [Table 2]. Patient satisfaction survey revealed that about 73% (44 cases out of the total of 60) were satisfied with the treatment results. For the remaining 16 cases, the improvement achieved was not up to their expectations. In general, rolling scars were seen to respond the best to fractional laser resurfacing monotherapy [Figure 2] while icepick pitted scars responded the least. In fact, almost all of the rolling scars showed excellent response to treatment and all the 11 patients who showed >75% improvement in scars had predominantly rolling type of scars [Table 2]. On the other hand, patients who achieved the minimum improvement score had predominantly ice-pick scars or deep boxcar scars on their face [Figure 3]. Adverse effects to the treatment regimen were usually transient and included erythema that usually lasted for an average of 3-4 days, superficial crusting lasting for 4-6 days and mild transient edema. Transient acneiform lesions were seen in 6 patients and in 2 of these, oral treatment was necessitated. The only significant adverse effect observed was post-inflammatory hyperpigmentation that developed in 3 cases in our study. This pigmentation resolved with topical therapy over a period of 2-3 months. It is always a challenge to treat a patient with moderate to severe acne scars. There are morphologically different types of scars and the individual depth of these scars also varies in between patients and even in a single patient. All these factors make the assessment of efficacy of any therapeutic option difficult to judge across all the patients. Laser resurfacing with CO 2 laser or Er:YAG laser gives excellent results when used in the treatment of aging skin and acne scars. , However, the risks associated with the procedure including the chances of prolonged erythema lasting for weeks to months, oozing and crusting and post-inflammatory pigmentation especially in darker skin limit the usefulness of this therapeutic option. Fractional laser technology obviates many of these drawbacks as only a 'fraction' of the whole skin is treated and the integrity of epidermis is not compromised. As each microscopic wound created by the laser device is surrounded by normal, healthy tissue, the healing is rapid and the adverse effects are reduced to a considerable degree. In a single-blinded randomised study on acne scars, Hedelund et al. demonstrated statistically significant improvement in skin texture and atrophy in comparison with placebo after 3 monthly laser sessions with fractional CO 2 device. The study was conducted on 13 patients and the patients were also quoted as being 'satisfied' with the treatment option. Relatively higher energies in the range of 48-56mJ with a treatment density of 13% were used in this study. In Asian patients, Sung Bin Cho and co-workers demonstrated the efficacy as well as safety of fractional CO 2 laser resurfacing in acne scars. Half of the 20 patients enrolled in this study achieved clinical improvement of >50% while another 7 patients achieved 26-50% improvement. The mean post-treatment erythema and crusting lasted for 2.8 ± 4.6 days and 6.3 ± 3.0 days, respectively. In our study, we used energy in the range of 12-20J/cm 2 and treatment density of 150-200 MTZ/cm 2 in all patients. These treatment parameters were decided on the basis of the skin type of our patients as most of them had Fitzpatrick skin type 3 or 4. We treated all individual scars with the same laser fluence and treatment density irrespective of their depth or morphological type. Good to excellent response was achieved in about 67% patients on the quartile grading scale. This figure is in conformity with the figures quoted in most of the studies on CO 2 fractional laser resurfacing in acne scars. ,,,, While about 40% patients achieved >50% improvement, additional 27% patients were seen to have 25-50% improvement in scar morphology and texture in the study group. Subjectively also, majority of the patients were satisfied with the results obtained after the end of treatment schedule. Adverse effects seen were not significant and none of the enrolled patients had any long-term or permanent side effects from the procedure. However, there is certainly some down-time associated with fractional CO 2 laser resurfacing as patients do experience crusting for a few days after the procedure. This crusting makes it impossible for patients to resume their normal work for a few days after each laser session. A nice way to circumvent this problem is to perform the procedure just before a weekend so that the patients get a rest of 2 days and no professional commitments are missed after the laser sessions. Additionally, post-inflammatory hyper pigmentation was observed in 3 patients in our series which resolved with topical treatments over a span of 6-12 weeks. This warrants the use of broad spectrum sunscreens and limitation of sun exposure after the laser sessions are performed. Another important fact is that there are just a few studies that have commented upon the therapeutic results in different morphological types of acne scars. ,,,, All other studies have made a generalised or a sweeping statement on the results obtained without taking into account the differences in the response between the morphological scar types. Lastly, it is important to realise that a typical patient has scars of different morphological types and grades and it is difficult to treat all these scar types satisfactorily with a single treatment option and multiple techniques are required. However, of all the treatment options available to treat post-acne scars, fractional photothermolysis is probably the only monotherapy that offers the highest degree of scar amelioration and patient satisfaction. 1. Layton AM. Psychosocial aspects of acne vulgaris. J Cutan Med Surg 1998;2 (Suppl 3):19-23. 2. Jacob CI, Dover JS, Kaminer MS. Acne scarring: A classification system and review of treatment options. J Am Acad Dermatol 2001;45:109-17. 3. Goodman GJ. 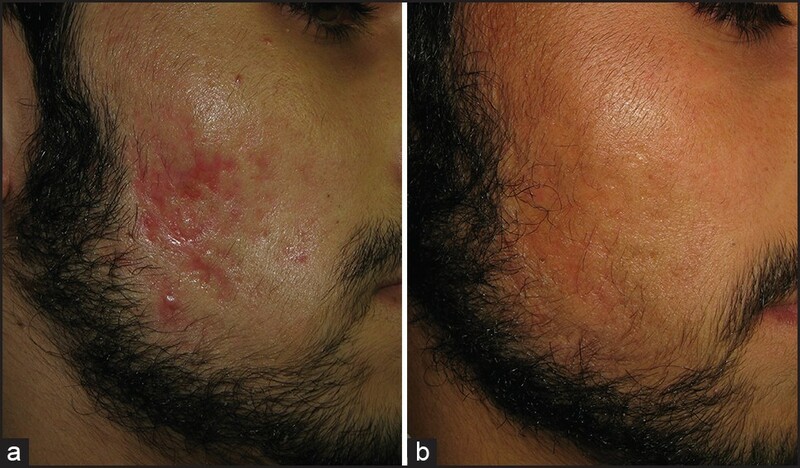 Postacne scarring: A review of its pathophysiology and treatment. Dermatol Surg 2000;26:857-71. 4. Kadunc BV, Trindade de Almeida AR. Surgical treatment of facial acne scars based on morphologic classification: A Brazilian experience. Dermatol Surg 2003;29:1200-9. 5. Geronemus RG. Fractional photothermolysis: Current and future applications. Lasers Surg Med 2006;38:169-76. 6. Rivera AE. Acne scarring: A review and current treatment modalities. J Am Acad Dermatol 2008;59:659-76. 7. Susan W, Brian ST, James C, Gregory A, Andrei E, Ilya Y, et al. Fractional photothermolysis: A novel aesthetic laser surgery modality. Dermatol Surg 2007;33:525-34. 8. Cho SB, Lee SJ, Cho S, Oh SH, Chung WS, Kang JM, et al. Non-ablative 1550-nm erbium-glass and ablative 10 600-nm carbon dioxide fractional lasers for acne scars: A randomized split-face study with blinded response evaluation. J Eur Acad Dermatol Venereol 2010;24:921-5. 9. Alster TS, Tanzi EL, Lazarus M. The use of fractional laser photothermolysis for the treatment of atrophic scars. Dermatol Surg 2007;33:295-9. 10. Gold MH, Heath AD, Biron JA. Clinical evaluation of the SmartSkin fractional laser for the treatment of photodamage and acne scars. J Drugs Dermatol 2009;8:s4-8. 11. Hu S, Chen MC, Lee MC, Yang LC, Keoprasom N. Fractional resurfacing for the treatment of atrophic facial acne scars in asian skin. Dermatol Surg 2009;35:826-32. 12. Rahman Z, Tanner H, Jiang K. Treatment of atrophic scars with the 1550nm erbium-fiber fractional laser. Lasers Surg Med 2006;38:24. 13. Campbell TM, Goldman MP. Adverse Events of Fractionated Carbon Dioxide Laser: Review of 373 Treatments. Dermatol Surg 2010;36:1645-50. 14. Metelitsa AI, Alster TS. Fractionated laser skin resurfacing treatment complications: A review. Dermatol Surg 2010;36:299-306. 15. Sardana K, Garg VK, Arora P, Khurana N. Histological validity and clinical evidence of use of fractional lasers for acne scars. J Cutan Aesthet Surg 2012;5:75-90. 16. Alexiades-Armenakas MR, Dover JS, Arndt KA. The spectrum of laser skin resurfacing: Nonablative, fractional, and ablative laser resurfacing. J Am Acad Dermatol 2008;58:719-37. 17. Fitzpatrick RE, Goldman MP, Satur NM, Tope WD. Pulsed carbon dioxide laser resurfacing of photoaged facial skin. Arch Dermatol 1996;132:395-402. 18. Nanni CA, Alster TS. Complications of carbon dioxide laser resurfacing. An evaluation of 500 patients. Dermatol Surg 1998;24:315-20. 19. Chapas AM, Brightman L, Sukal S, Hale E, Daniel D, Bernstein LJ, et al. Successful treatment of acneiform scarring with CO 2 ablative fractional resurfacing. Lasers Surg Med 2008;40:381-6. 20. Hedelund L, Haak CS, Togsverd-Bo K, Bogh MK, Bjerring P, Haedersdal M. Fractional CO 2 laser resurfacing for atrophic acne scars: A randomized controlled trial with blinded response evaluation. Lasers Surg Med 2012;44:447-52. 21. Cho SB, Lee SJ, Kang JM, Kim YK, Chung WS, Oh SH. The efficacy and safety of 10,600-nm carbon dioxide fractional laser for acne scars in Asian patients. Dermatol Surg 2009;35:1955-61. 22. Katz B. Efficacy of a new fractional CO 2 laser in the treatment of photodamage and acne scarring. Dermatol Ther 2010;23:403-6. 23. Chan NP, Ho SG, Yeung CK, Shek SY, Chan HH. Fractional ablative carbon dioxide laser resurfacing for skin rejuvenation and acne scars in Asians. Lasers Surg Med 2010;42:615-23. 24. Bhardwaj D, Khunger N. An assessment of the efficacy and safety of CROSS Technique with 100% TCA in the management of ice pick acne scars. J Cutan Aesthet Surg 2010;3:93-6. 25. Goodman GJ. Treating scars: Addressing surface, volume and movement to expedite optimal results. Part 2: More severe grades of scarring. Dermatol Surg 2012;38:1310-21. 26. Kang WH, Kim YJ, Pyo WS, Park SJ, Kim JH. Atrophic acne scar treatment using triple combination therapy: Dot peeling, subcision and fractional laser. J Cosmet Laser Ther 2009;11:212-5. 27. Weiss R, Weiss M, Beasley K. Long-term experience with fixed array 1540 Fractional erbium laser for acne scars. Kissimmee, FL: Abstract presented at American Society for Laser Medicine and Surgery Conference; April 2008. 28. Sardana K, Manjhi M, Garg VK, Sagar V. Which type of atrophic acne scar (ice-pick, boxcar or rolling) responds to nonablative fractional laser therapy? Dermatol Surg 2014;40:288-300. 29. Lee HS, Lee JH, Ahn GY, Lee DH, Shin JW, Kim DH, et al. 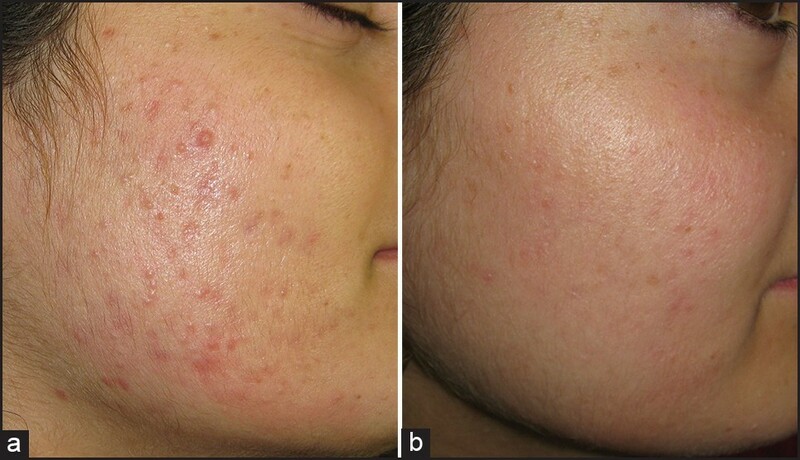 Fractional photothermolysis for the treatment of acne scars: A report of 27 Korean patients. J Dermatolog Treat 2008;19:45-9. 30. Hedelund L, Moreau KE, Beyer DM, Nymann P, Haedersdal M. Fractional nonablative 1,540-nm laser resurfacing of atrophic acne scars. A randomized controlled trial with blinded response evaluation. Lasers Med Sci 2010;25:749-54. 31. Mahmoud BH, Srivastava D, Janiga JJ, Yang JJ, Lim HW, Ozog DM. Safety and efficacy of erbium-doped yttrium aluminum garnet fractionated laser for treatment of acne scars in type IV to VI skin. Dermatol Surg 2010;36:602-9.